Can Robots Do It Better? Four keys to launching a successful robotic process automation program—from those who have been there. Robotic process automation (RPA) has been a hot topic for companies looking to reduce costs and gain a competitive advantage. As RPA continues to gain mainstream popularity, many companies still don’t know how or where to get started. Last year, APQC conducted a study1 and found that slightly more than 50 percent of survey participants had started an RPA program. As consultants—always eager to solve strategic problems—we wanted to dive deeper and look at barriers to getting started. What differentiated those organizations that had been successful with RPA programs already? We sat down with senior business and technology leaders from various Atlanta-based organizations to discuss their RPA journey. We shared our experiences with RPA and asked thought-provoking questions to facilitate discussion and foster information sharing with those around the table. 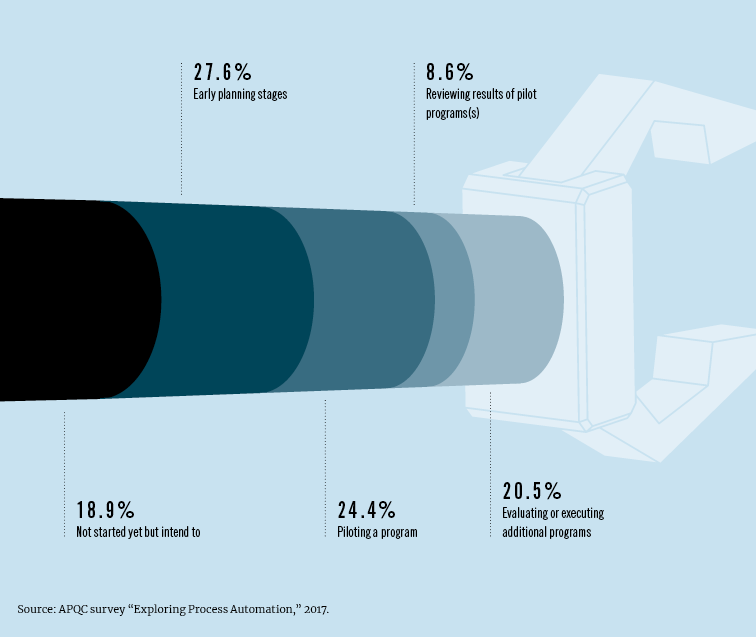 As the APCQ survey depicts, many of the organizations we convened had yet to start their RPA journey. In this forum, we gained a deeper understanding of why many hadn’t been able to start. We also learned about the achievements and challenges from those that had successfully implemented RPA solutions. For those who are interested in RPA for your organization, we summarized our key takeaways into four categories that can help organizations get off the starting block to run a successful RPA program. Where Are Organizations on Their Journey? The business case for RPA must appeal to and ultimately gain the buy-in of the business, technology, and financial decision-makers. This is particularly important because a successful RPA implementation crosses organizational teams and involves multiple stakeholders. It will be important to define and appeal to a well-understood pain point or value-driver with the business case. Although cost savings is a leading rationale behind the interest in RPA, it isn’t the only benefit. The ability to prove cost savings from an RPA program can be challenging, especially at first, when savings may be only incremental until bots (short for robots) are running at scale. Every business case must make a case for return on investment, but it doesn’t have to be limited to cost savings. Consider incorporating the following benefits we heard in our discussion of the value RPA achieves in different companies and use cases. Compliance and consistency: Bots remove human error and always follow the rules as defined. This yields high value, especially in areas such as finance, where compliance is mandated. Data quality and accuracy: RPA can ensure a single record of truth and can accurately copy data from one source to feed another. Risk avoidance/reduction: Automating manual efforts in a virtually error-proof way, RPA can reduce or eliminate risk in certain areas, making RPA a high-value investment. Customer Engagement: Bots can monitor key words across various channels of customer feedback. Analyzing this data can drive changes needed to address issues and improve the customer experience. RPA is an investment in efficiency. It is also an investment that will create value for an organization in strategic ways. For example, with bots performing manual tasks, employees will have more time for “heads up” activities with a positive impact on customer experience and strategic benefit toward business goals. RPA can raise skill levels and provide human workers more time for high-value activities such as serving the customer, tackling unexpected problems and opportunities, and developing new capabilities for your organization. As you build your qualitative and quantitative case for how RPA will achieve value, think outside the cost-reduction box to build a well-rounded business case. Building a case for how RPA will drive value is foundational. Having an advocate at a senior level can also be important because it may take time to see the return on investment. The up-front work to develop requirements and rules and build the bots will be iterative. Initial efficiency gains will be incremental. Because RPA involves a partnership between IT and the business, top-down support is critical to ensure that implementation remains a priority and retains attention at the working team level. Having leadership oversight and buy-in drives top-down program delivery, establishes ownership and supports motivation, reduces resistance to change, and facilitates a willingness to adapt to change. This support greatly increases the probability of program success. Anchor on key pain points to communicate a burning platform that will resonate with leadership and gain their buy-in. Tell the story with different layers to appeal to the “what’s in it for me” of your audience. For example, the CFO will consider the effect on the bottom line, while your operations leadership will focus on improvements to the process itself and changes to how the organization operates. Beyond the financial and operational significance, connect to leadership at the level of bringing value to employees, their job satisfaction, and making an investment in people. Think about RPA as a capability—and a way to raise the capabilities across the area where it will be applied. In our roundtable discussions, several organizations shared stories about the bumps along the road—unexpected system integration hiccups or unanticipated business scenarios requiring human intervention or new rules. Having a senior advocate for the program will help maintain a consistent level of attention and support for delivering the program as required—so it can be implemented at scale and realize expected value. Bill Gates’ quote is paramount when selecting the use case for RPA. You need a strong process and good data for RPA to work well. The exceptions must be known and well defined. These elements will be critical to developing the requirements and rules to operate the bots. Think about these questions to evaluate whether your use case is a good one for RPA. Has the process been optimized? RPA will provide incremental gains on an already optimized process. This capitalizes on the work already done and applies technology as a tool to realize increased value. Is the process in steady state? An evolving process means development changes will be required to operate the robots in the revised process. If you select a use case that is already in steady state, you’ll limit rework and costly development changes. Does the process have a set process owner? A process without ownership will yield an RPA effort without ownership. Additionally, the process owner will know where exceptions should be programmed and the points at which human intervention are required. This is a critical role both at setup/implementation and for ongoing RPA functionality. Successful RPA programs are a great example of business and technology teams working together. Depending on your organization’s structure, different functional teams can take ownership of the RPA program: the business side, the technology side, or a strategic transformation or innovation team. Our view: Regardless of who owns the RPA program, it will require business sponsorship and collaboration across teams to succeed in the long run. Business sponsorship ensures that the bots are integrated as a tool within the process. As the needs of the process change or systems are updated, the business owners will be aware of potential impacts to the bots. Business involvement ensures that changes are identified and implemented to keep the bots functioning and optimized. Cross-functional RPA teams will also likely extend to include various business stakeholders, lines of business, or regions. Like other systems, developing RPA will include defining and documenting processes, requirements, and rules. Various stakeholders will likely be engaged to represent the handoffs, data inputs, downstream data requirements, and reporting that could be involved in the RPA scenario. Human resources is a stakeholder not to be overlooked. In many organizations, bots must be onboarded through the same process as a new hire to obtain credentials so they have access to data across systems. RPA can serve as a bridge for multiple stakeholders by helping to establish and maintain process standardization. Find the common driver to bolster support from various stakeholders and keep them engaged. Connect on common pain points and opportunities to drive value in a way that integrates them throughout the RPA journey. Thinking of RPA as a journey is significant. At scale, bots working across the organization will provide greater value than a single application, especially given the required start-up investment. A center of excellence (COE) drives long-term success as the RPA program matures. A COE fosters ongoing cross-functional support and participation, and can break down barriers of implementation across departmental lines. It also provides needed governance. Establish and maintain best practices and standards as RPA gains momentum and is applied to new areas across the organization. This, in part, is what drives the increased value that RPA at scale can achieve. At the end of the day, the best piece of advice we have about overcoming up-front obstacles is to just get started! This advice—based on multiple shared experiences—can get you closer to realizing operational and strategic value with RPA. Can robots do it better? Yes, if you build your program with a well-defined value case, support from leadership, an appropriate use case, and engaged business sponsors. RPA is one stage along the automation journey. As your organization and priorities evolve, you may pursue opportunities in artificial intelligence and machine learning. Define success to align and manage stakeholder expectations, measure the incremental efficiency gains, and keep going to realize value at scale. APQC survey “Exploring Process Automation,” 2017.